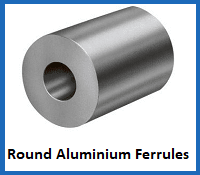 Aluminium ferrules are a popular choice for securing wire rope assemblies, and you can find a wide variety of custom-made options right here at Rope Services Direct. We can fit any aluminium ferrule sizes you require and create a bespoke assembly to tackle various lifting tasks. 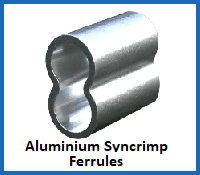 Aluminium ferrules are cost-effective and practical, providing the perfect way to secure the termination point of a steel wire rope in place with a tight compression fit. This ensures that the rope remains resilient when handling payloads of various sizes. The main drawback is that aluminium is more susceptible to corrosion than some other materials, especially in environments where electro-chemical contamination is likely. Check out our full line-up of cable and wire rope ferrules to find the copper, carbon and stainless steel alternatives. We press our ferrules using cutting edge equipment, creating a tight bond that is strong, resilient and reliable. This is especially important when considering wire rope safety, across a variety of applications. Our production facility is also kitted out with modern manufacturing solutions to ensure that every ferrule fitting we create is built to last and adjusted to your exact specifications. If you need wire rope to go with aluminium ferrules, explore our comprehensive array of options here. 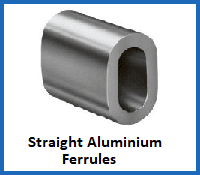 To get all the information and guidance you need on aluminium ferrules, contact us direct at Rope Services Direct. You can drop us an email via our website, or call 01384 78004 to speak to a helpful member of the team. Aluminium Ferrules Overall rating: 5 out of 5 based on 6 reviews.